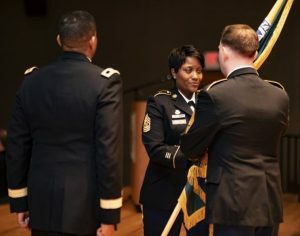 January 17, 2019 by Robert Ortiz-Abreu, Jr.
CSM Lynice Thorpe-Noel assumed responsibility of the Army’s Human Resources Command (HRC) as its first female Senior Enlisted Advisor. During a ceremony hosted by MG Jason T. Evans, HRC Commanding General, held on Fort Knox, 17 January 2019, CSM Wardell Jefferson officially relinquished his duties to CSM Lynice Thorpe-Noel. CSM Thorpe-Noel, who spent the last few years as the HRC Enlisted Personnel Management Directorate Sergeant Major, now takes on the leading enlisted role for HRC. The command conducts distribution, strategic talent management, and information technology for a full spectrum of human resources programs and services, Army wide. Those programs and services enable the Army to deploy, fight and win our nation’s wars. “The main focus from my foxhole is setting the right environment for ambitious strategic thinkers to optimize the Army’s lethality; getting the right Soldiers, with the right capabilities, in the right position at the right time. What we do at HRC is critical to the overall mission of America’s Army,” she said. “This may sound simple, but there is an art and science to getting human resources right and our team does just that on a daily basis.” In terms of the direction she sees HRC and the Army going, CSM Thorpe-Noel said readiness is key. CSM Jefferson, who assumed responsibility of HRC in August of 2015, now heads to the Pentagon where he will serve as the Sergeant Major for the Deputy Chief of Staff of the Army, G-1. Under his watch, HRC was instrumental in the formation and manning of Security Force Assistance Brigades. He spearheaded the Enlisted Talent Management system which optimized readiness and leader development through force alignment and career management. CSM Jefferson continues to work in unison with Army G-1 in the development, fielding and roll-out of the Integrated Personnel and Pay System-Army. “One of the biggest initiatives that we accomplished as a team during my tour as the HRC CSM is improving the way we manage the Enlisted population. Although Talent management (TM) doesn’t fall completely on the shoulders of HRC, we do play an important role in that,” CSM Jefferson said. What does AGCRA offer me?